The Nereids were part of the Greek pantheon of deities in antiquity, and like many of this pantheon, the Nereids were associated with water, for the Nereids were Greek sea nymphs. Water had many different deities associated with it, including the important gods Poseidon and Oceanus, the Nereids were perhaps at a lower level of importance, but were contemporary with the likes of the Oceanids, the Potamoi, and Naiads. Ancient sources tell of there being 3000 Oceanids and the same number of Potamoi, but there were fewer Nereids, for there were said to be but 50 of this group of water nymphs. These 50 Nereids were the daughters of the ancient sea god Nereus, and his wife Doris, an Oceanid. The Nereids were said to be beautiful young maidens, commonly found frolicking amongst the waves of the Mediterranean, or sunning themselves on rocky outcrops. The Nereid sea nymphs were seen as benevolent figures, and were often said to help the sailors and fishermen who were lost or in distress. To give thanks for the Nereids, most of the fishing ports and harbours throughout Ancient Greece would have a shrine or similar structure dedicated to the daughters of Nereus. The primary role of the Nereids though was to act as attendants to Poseidon, and so they were commonly seen in the company of the god. Whilst associated with the Mediterranean, they were thought to be specifically concentrated with the Aegean Sea, for this was where their father, Nereus, had his palace. Despite there being only 50 Nereids there is no consensus amongst the writers of ancient texts about the names of the Nereids. Despite this lack of agreement, the names given to the Nereids would represent a personification of a particular attribute of the sea. So the Nereid Melite was representative of calm seas, Actaea, was the personification of the seashore, and Eulimene, was seen to represent good harbouring. These three Nereids though are virtually unknown today, and indeed the names of most of the Nereids would be unrecognisable to the vast majority of people. There are though a handful of Nereids whose names are relatively famous. 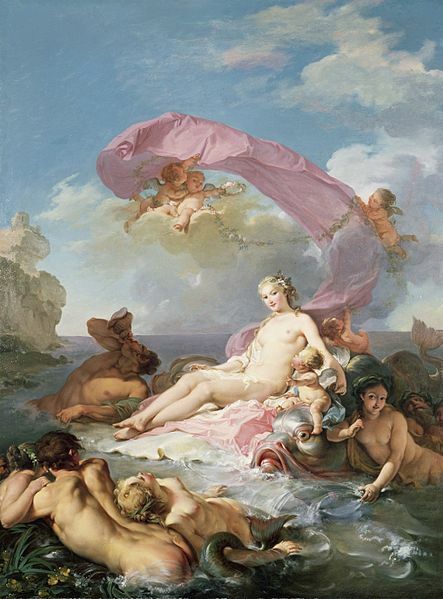 Amphitrite is amongst the most famous of all of the Greek sea nymphs, for the Nereid was the wife of the Olympian sea god Poseidon. Initially, though, Amphitrite did take kindly to Poseidon attempting to make the Nereid his wife, indeed, Amphitrite would flee from these advances. Amphitrite would find refuge at the furthest extremes of the sea. Whilst Poseidon could not find Amphitrite, the hiding place of the Nereid was discovered by Delphin, the dolphinesque sea god. Delphin talked to Nereid and convinced her to return, and wed, Poseidon. Delphin was persuasive, and Amphitrite did return to become the Queen of the Sea, and would sit beside her new husband, Poseidon. Possibly even more famous than Amphitrite is the Nereid Thetis, for Thetis was often said to be the leader of the Nereids. Even amongst the beautiful Nereids, Thetis was often said to be the most beautiful, and her looks attracted both Zeus and Poseidon. 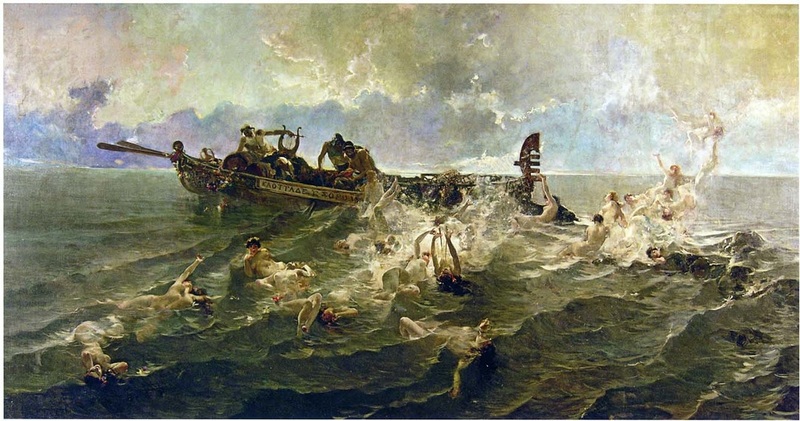 Before either god could have their way with the sea nymph though, a prophecy was told of the son of Thetis becoming even more powerful than his father. Neither Zeus nor Poseidon wished for their potential son being more powerful than them, and so Zeus arranged for Thetis to be married off to a mortal, the Greek hero Peleus. Thetis had no desire to be married to a mortal though, and like Amphitrite before her, she fled from the advances of her suitor. Eventually though, Peleus would catch her in a trap, and a marriage between Thetis and Peleus was agreed upon. 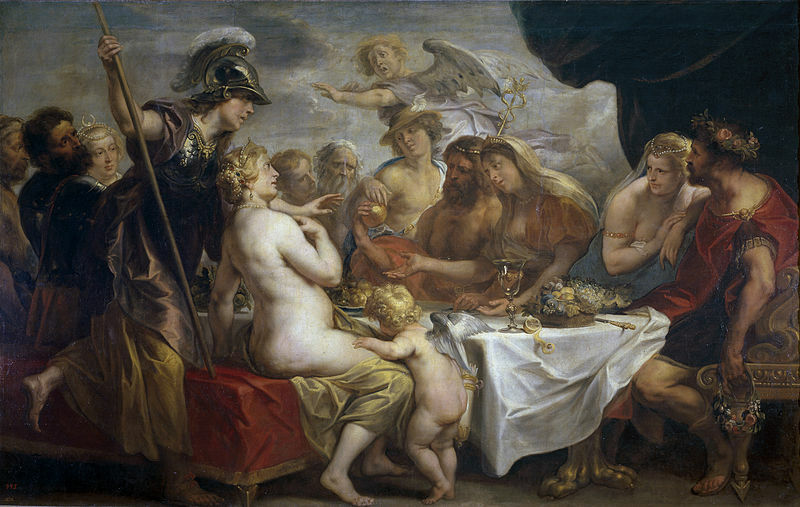 Events at the wedding feast would be one of the starting points of the Trojan War. The marriage of Thetis and Peleus would bring forth one son, Achilles, a Greek hero who indeed would be more powerful than his father, just as the prophecy had stated. When Achilles was still young, Thetis would attempt to make her son immortal, making use of ambrosia and fire to burn away the mortal part of Achilles. Thetis though was discovered in the act, and so fled from the angry Peleus, back to her father’s palace. Thetis though would continue to keep a watchful overview on her son, and when the Trojan War broke out, Thetis tried to hide Achilles away, although the hiding place was discovered by the resourceful Odysseus. The Nereid Thetis would also appear in the Argonautica the story of Jason and the Argonaut’s quest for the Golden Fleece. In keeping with the benevolent nature of Greek Nereids, Thetis guided the Argo through the twin dangers of Scylla and Charybdis. 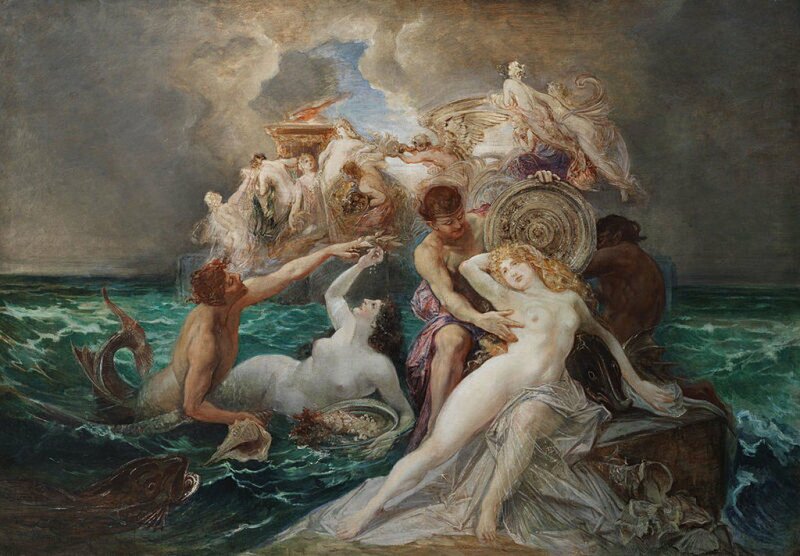 A third famous Nereid is Galatea, and she, like her sisters Amphitrite and Thetis, had a famous suitor, for Galatea was pursued by the Cyclops Polyphmeus. 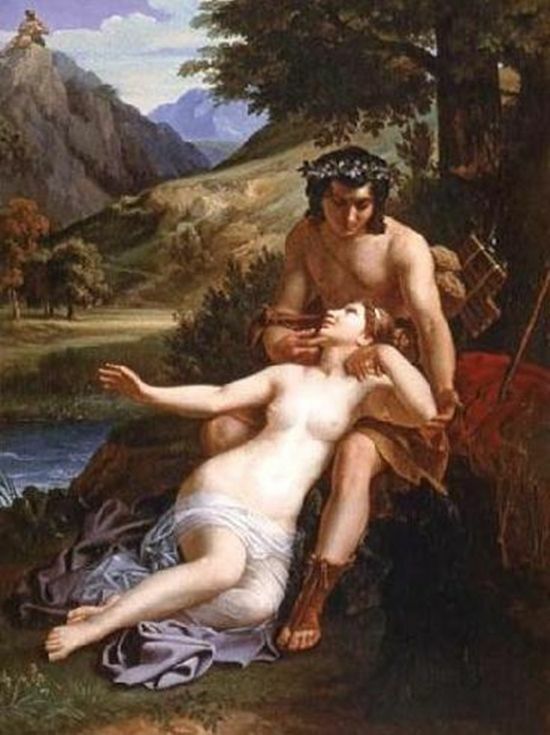 The story of the Nereid Galatea is one of antiquity’s most famous love stories, for a love triangle sees Galatea not in love with Polyphemus, but with the shepherd Acis. Polyphemus does away with his rival by crushing Acis beneath a boulder, with Galatea then transforming Acis into a river. In some versions of the tale, Galatea though does allow herself to be wooed by Polyphemus, who in these versions is far from being a savage, and a match between Galatea and Polyphemus would have been a suitable one. The Nereids also appeared en masse in a tale from Greek mythology, for the sea nymphs, like most others in the Greek pantheon, were quick to anger when slighted. It is tale that overlaps with the story of Perseus, for at this time the King of Aethiopia (unknown Africa) was Cepheus. Cepheus was married the beautiful Cassiopeia, but Queen Cassiopeia recognised her own beauty, and loudly proclaimed it, even going as far as saying that she was more beautiful than any Nereid. The Nereid sea nymphs took umbrage with such a boast from a mere mortal, and complained to Poseidon. To appease the Nereids Poseidon dispatched the sea monster Cetes to ravage the lands of Aethiopia. The only way that Cetes could be placated was for Cepheus to sacrifice his own daughter, Andromeda, but luckily for princess Andromeda, Perseus was on the return leg of his quest for the head of Medusa. So Perseus made use of the head of the gorgon Medusa, turned Cetes to stone, and rescued Andromeda.